Apparition Media blur the lines between advertising and art by hand painting works of art onto the walls of pre-existing buildings. 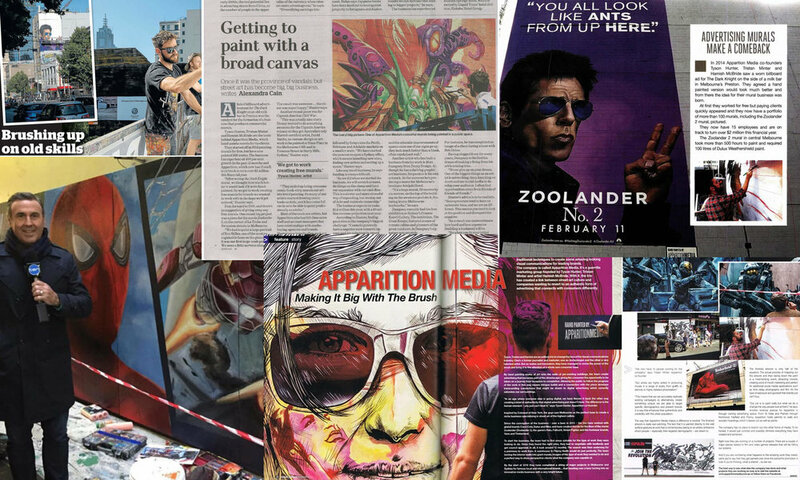 Recognising the potential for art to capture and captivate the minds of passers-by, Apparition Media have, since 2014, placed hand-painted advertising murals which fit seamlessly with the street scenery throughout Melbourne, Perth, Sydney and Brisbane. Since the start-up’s inception in 2014, Apparition Media have engaged the services of more than 30 artists, providing a paid platform where they can share their talents with a wider audience and in some circumstances, combine creativity with a strong social conscience, invoking local and international acclaim. Progressive PR & Communications have managed the publicity for Apparition Media across a range of campaigns over the past three years. During this time, we have developed and implemented a national communications strategy to create brand awareness, drive new business and establish them as the market leader in the industry across consumer and trade media.